Soren Emil Carlsen (October 19, 1853 – January 2, 1932, New York City, U.S.) was an American Impressionist painter who emigrated to the United States from Denmark. He became known for his still lifes and while by some he has been described as "The American Chardin" he was in fact a far more sensitive aesthetically oriented artist. In an era when many artists succumbed to the pressure resulting from The Armory Show to follow modernistic "developments" Carlsen remained faithful to his inborn aesthetic sense continuing to create at an extremely high qualitative level. It is not a stretch to view him as one of the truly great American artists of the twentieth century. Later in his career Carlsen expanded his range of subjects and becoming known for landscapes and marines as well. During his long career he won many of the most important honors in American art and was elected to membership in the National Academy of Design. For more than forty years he was also was a respected teacher in Chicago, San Francisco and New York. Emil Carlsen was born and raised in the Danish capital of Copenhagen. He came from an artistic family, his mother painted, and by some accounts, his cousin, who was an influence on him later became the director of the Danish Royal Academy He studied architecture at the Royal Academy in Copenhagen for four years and then emigrated to the United States in 1872, settling in Chicago, United States. Interested in art, he first worked as an architect's assistant and studied with the Danish marine artist Lauritz Holst. However, Holst returned to Denmark, leaving his studio to Carlsen. He made rapid progress and was appointed the first teacher of drawing and painting at the Chicago Academy of Design, Carlsen sought more training and embarked for Paris in 1875, where he came under the influence of the French still life painter Jean-Baptiste-Siméon Chardin. When he returned to the United States, he set up a studio in New York and began to painted tonalist still lifes that were somewhat reminiscent of those of Chardin. However, selling work was still a struggle. After moving to Boston he had a short period of good sales. He returned to New York and again struggled to sell his paintings. In 1879 he held an auction to help ease his financial situation but ended up selling only a few paintings. This compelled him to give up his studio and take up engraving with which he found some success despite his frustration at not being able to paint full-time. These often depicted copper pans, game, or flowers. The acceptance of a still life in the exhibition of the Pennsylvania Academy of Fine Arts in 1883 was the first noteworthy event in his career. In 1884 he returned to Europe, painting commissions of floral still lifes for the dealer, Theron J. Blakeslee, to support his studies. Eventually he turned his back on the demand for pretty flowers. In 1885 Carlsen had two works accepted for the Paris Salon. Returning to New York he opened a studio on 57th Street. However, finding that it was still difficult to sell paintings he moved to San Francisco where between 1887 and 1889 he held a position as director of the California School of Design. He became friends with Arthur Mathews, who taught at the School of Design and was the leading figure in the Bay Area Arts and Crafts Movement. He then moved on to teach privately at the San Francisco Art Students until 1891. During those years he influenced a number of young students, among them Guy Rose, a Southern California painter who would become a leading Giverny Impressionist. Carlsen moved back to the east from California in 1891 and began a long career of teaching in the East. He taught at the National Academy of Design, at the student-founded Art Student's League, and the Pennsylvania Academy of Fine Arts. Gradually, through his relationship with other New York based painters and teachers such as John Twachtman and Julian Alden Weir, he became interested in painting landscapes and marines. 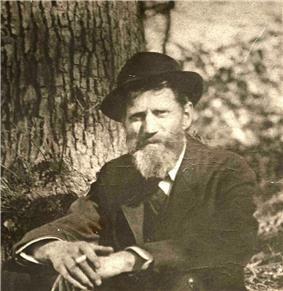 Carlsen sketched in Connecticut in the early 1900s, visiting his friend Julian Alden Weir in Branchville, Fairfield County, Connecticut. This became the famous "Weir Farm" where many American Impressionist painters painted landscape plein-air. The Carlsens together with their young son Dines and spent several summers living on a cottage on the farm. The artists would paint during the day and socialize in the evening. Carlsen purchased a home in Falls Village, Connecticut in 1905 and the Carlsen family spent most of their time there when Carlsen did not have teaching commitments in New York. Falls Village is in the Berkshire Foothills and Carlsen painted the rolling foothills and the forests of the Berkshire Mountains. Although he was considered to be one of the most respected American painters, Carlsen struggled financially for the first several decades of his career. The Macbeth Gallery in New York was the first gallery that specialized in the work of American artists. After Carlsen joined the gallery, which represented many of the American Impressionism artists, his sales improved and for the first time he was able to live comfortably without constant financial stress. He had solo exhibitions at Macbeth in 1912, 1919 and 1921 and 1923. He received the Samuel T. Shaw Purchase Prize at the National Academy of Design. Emil Carlsen was a sought after teacher and financial necessity drove him to teach more than he wanted, taking time away from his painting. As he became more financially successful, he cut back on his teaching commitments. He taught the life class at the National Academy of Design from 1905 to 1909. He commuted from New York to Philadelphia to lecture at the Pennsylvania Academy of Fine Arts for many years. Emil Carlsen married Luela Mary Ruby in 1896 and the couple moved into his 59th Street studio, where they made their home the rest of their lives. They had a single child, Dines Carlsen in 1901 who was home schooled. His mother taught him his scholastic subjects and his father instructed him in art. Dines Carlsen began his own exhibition career in 1914, exhibiting a still life at the National Academy of Design when he was thirteen. Dines Carlsen was made an Associate National Academician in 1922, when he was 21 and a full Academician in 1942. Dines Carlsen exhibited alongside his father at the Grand Central Galleries in New York. He had three solo exhibitions at that gallery. After Dines Carlsen died in 1966, Grand Central Galleries held a dual retrospective exhibition to honor both artists. Carlsen was close friends with Julian Alden Weir, John Twachtman and Childe Hassam. Professor William Gerdts wrote extensively of Carlsen and his aesthetic sensibility in his book on American still life painting "Painters of the Humble Truth" and he describes the objects in the paintings as ..."often lacking in traditional beauty, What makes the paintings beautiful is Carlsen's sensitivity in arrangement - large shapes are juxtaposed with small flat forms and tall ones, their outlines are often united in refined harmonious curves. and are placed backward and forward on their limited support surface to allow for "breathing room," for slow movement in space." Carlesen's special concern was still life, and his paintings are beautifully crafted and delicate of surface, reminiscent of Whistler and especially Dewing. Carlsen was concerned with "ideal beauty" as well as the beauty inherent in the subject, in texture and color; as in Dewing's works, the placement of the objects on his canvas is extremely important..."
Carlsen was attracted to the beauties of the rolling hills and interpreted them in soft, pastel tones. Carlsen's landscape mode, however, is more more completely of this century, and it developed in the more decorative, somewhat naturalistic manner that characterized later Impressionism. The art collector Duncan Phillips wrote of Carlsen that his ocean scenes had "a certain trance-like mood." ^ a b Herringshaw, Thomas William. , p. 387.American Elite and Sociologist Bluebook American Blue Book Publishers, 1922. ^ Connecticut and American Impressionism , Exhibition Catalog, p. 154, entry on Carlsen. ^ Gerdts, Painters of the Humble Truth, p. 228 and Price disagree on whether this was his brother or cousin, but Price's account came from Carlsen himself. ^ It is often incorrectly stated that Carlsen taught at the Art Institute, but the Chicago Academy of Design was founded in 1866, modeled after the NAD in New York, only in 1882 did the name change to the familiar A.I.C. See WorldHeritage entry on the Art Institute. ^ Emil Carlsen, “On Still-Life Painting," Palette and Bench (October 1908): p. 6-8. ^ Arthur Edwin Bye, Pots and Pans or Studies in Still Life Painting (1921), p. 213-214. ^ Gerdts, American Impressionism, p. 229. Arthur Edwin Bye, Pots and Pans or Studies in Still Life Painting (Princeton: Princeton University Press, 1921), 213-214. American Elite and Sociologist Bluebook, p. 387. American Blue Book Publishers, 1922. William H. Gerdts, Painters of the Humble Truth: Masterpieces of American Still Life, 1801-1939 (Columbia, Miss. : University of Missouri Press, 1981), 22.
lrich W. Hiesinger, Quiet Magic: The Still-Life Paintings of Emil Carlsen (New York: Vance Jordan Fine Art, 1999). Emil Carlsen, “On Still-Life Painting,” Palette and Bench (October 1908): 6-8.